Plying a well-worn style or genre is always a gamble for a new band, even when we take into account that no one is an infinite well of inspiration. On one hand, a familiar sound can immediately offer listeners an idea of what to expect and can attract attention all on its own. On the other, being derivative is not a good look, and a ripoff artist even less so. On the fifth-dimensional supernumerary pseudopod, providing a continuation of work that another group has left behind can be quite valuable, and a way to make an impression in an ever-tighter market. 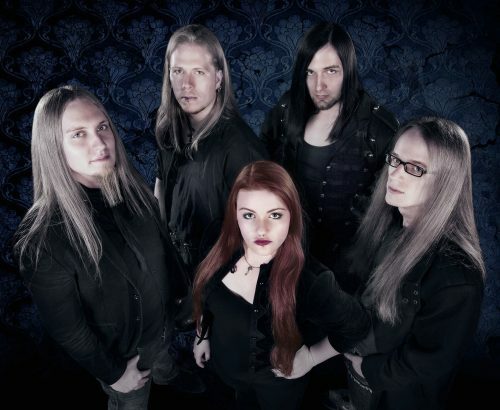 It is in this last category that we find our German heroes of the moment, Elvellon, a quintet that consciously or not follows closer than I previously believed possible in the shoes of Nightwish’s mid-period. Their debut album Until Dawn is a stone’s throw from both Century Child and Once, while offering a distinct character through some small changes in compositional technique. This statement alone is not an indication of quality, however, and gives rise to the most important question of all. 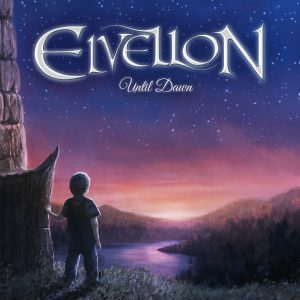 Do Elvellon manage to fill a gap left by Nightwish? Or are they condemned to the same pit as the glut of wannabes that have plunged to their demise over the years? Despite the immediately obvious similarities (a soaring operatic female vocalist with plenty of melisma, crunchy guitar and keys playing off each other, similar styles of riffing, etc. ), the devil’s in the details here. The first and greatest is compositional emphasis; unlike Nightwish and other, usually lesser, symphonic metal acts, Elvellon does not fall into the trap of building their compositions around the keyboardist. Ignoring the superfluous introductory and interlude flourishes, every track here builds around Gilbert Gelsdorf’s surging guitar through-line, with particularly good examples on “Oraculum,” “The Puppeteer,” title track “Until Dawn,” and soaring penultimate track “Born From Hope.” Even on ballad “Shore to Aeon,” which naturally leans on Nele Messerschmidt’s warmth and capacity for inviting softness, still girds its belly with (acoustic) guitar and piano rather than propping itself upright with fluffy keyboards. Other than some small overstretched segments and the fluff previously mentioned, Until Dawn (despite an hour-long run-time) is a solid album, and much more consistent than its inspirations, which both suffer varying degrees of filler. Where Messerschmidt can bounce off the crunching guitar, her meaty mezzo-soprano especially shines. She brings theatrically and an epic feel while also exhibiting a skill with more traditional metal singing (as opposed to something more operatic) that Tarja Turenen struggled with. She’s not the most powerful singer, however, but she provides plenty of bombast while still layering a melancholic sheen over the whole package, particularly on “Silence From the Deep” and the aforementioned “Hope.” I wish the guitar and bass work were less perfunctory, as this is truthfully more traditional power metal with a side of symphonicism in the vein of Blind Guardian’s later work or Rhapsody [of Fire], despite the strong aesthetic connection to Nightwish. Even great albums (which this is not) have an Achilles’ heel, and Until Dawn unfortunately borrows early 2000s production technique from their forebears. The mix is a mess, with vocals at times a bit too low or too high, the drums and bass frequently buried to the point of slight muting, and the keys and guitar fighting for dominance in the ear, rather than in the melodies where they should be. And the master, while it could certainly be worse, is squashed to hell, compounding these problems and robbing the softer moments of depth, and likely contributes to the perception of Messerschmidt as lacking power, as the mix (thankfully) does not cram the vocal lines to the tip-top of the sound form. Until Dawn, despite a strong knee-jerk negative reaction from me, turned things around with strong compositions and band cohesion, but this album deserved better production. If you’ve missed Nightwish’s mid-period like I had, this is a solid third-party addition to that canon, and I personally look forward to what they can offer in the future.